Goofy and totally original are two legitimate perspectives on a group which has songs regarding a confusion of child/adult size issues ("My I'm Large"), 'security blanket' aspect of helmets ("Helmet"), the prognosticative propensities of a weatherman sung by his wife ("Weatherman"), polka joy at The Fat Room ("Bulky Rhythm") etc. etc.. There are another dozen gems of skewed perspective and joyous wit by the team of Gunnar Madsen and Richard Greene. You must, but just in case you don't know, BOB, is a dog show acronym for Best Of Breed. 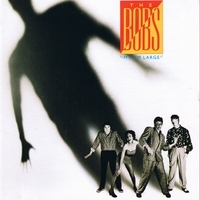 Though some new listeners may not know it, the Bobs are one of the most important voices in the world of a cappella music!